This year, the Centre for Suicide Prevention is teaming up with the Canadian Mental Health Association Calgary for Ride Don’t Hide, a community bike ride taking place on the morning of June 25, 2017. 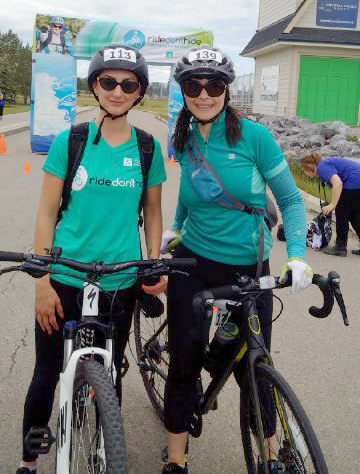 Ride Don’t Hide increases awareness about mental health, while raising funds for mental health programs and suicide prevention in Calgary. Funds raised by supporting or joining our team directly benefit the Centre for Suicide Prevention. Come out and support CSP while raising money for suicide prevention and breaking the stigma that surrounds mental health! Ride Don’t Hide is an initiative of CMHA National, and CMHA Calgary has been hosting for four years. Calgary is one of 32 communities across Canada participating in Ride Don’t Hide, and this year 8,000 participants are expected to ride. Pictured: Tammy Bogdane and Mara Grunau after their 20 km ride.